Discussion in 'What's Going On' started by 5944, Feb 6, 2019. Times up on RTT already. Heads South over the S&C about an hour after RTC's CME. any early news on the loco for this? So 35018 for the WCME so that leaves 45690 or 8F, place your bets ! Now that 35018 has been marked for the CME, presumably it'll be Leander on the Thunderer. They are being remarkably silent, given that it's less than a day away. It appears to have been mentioned in passing in the LE thread the 8F although no idea where the info came from? sunstream and Fulwood Flyer like this. 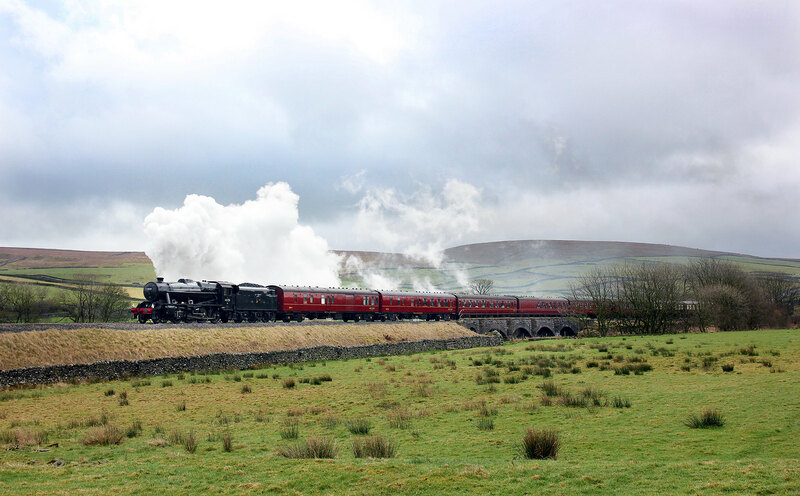 LMS 48151 on the last part of the climb to Aisgill in awful weather . Shep Woolley, 6960 Raveningham Hall, wazza588 and 13 others like this. I was right first time...you ARE mad! That looked like a struggle, well done Steve. Lunds and Leaving Carlisle in the rain. Landshrew, 6960 Raveningham Hall, 26D_M and 8 others like this. Shep Woolley, Landshrew, 6960 Raveningham Hall and 9 others like this. A Wet and Blustery Aisgill. Shep Woolley, 6960 Raveningham Hall, sgthompson and 1 other person like this.